Find out what our experts have to say about Honda Navi! The least priced variant is Honda Navi Street priced at Rs. 53,046 and the most priced variant is Honda Navi CBS priced at Rs. 55,237. Choose the Honda Navi which fits the bill of you. Some pronounce the Honda Navi as “Naa-vee” and some call it “Nya-vee”. It is actually “Na-vee”, meaning “New” in hindi as it brings not just a new affordable product, but also a whole new segment to the two wheeler market in India. Evidently, India is not completely new to such a unique product. If you remember we had the Bobby, erstwhile motorcycle company Rajdoot’s 173cc mini bike. The Bobby, which looked like it was built for adolescent kids, had 3 gears and had a max power of 7.5bhp. Don't be shocked if we say that this bike had a cult following, and hopefully if Honda plays its cards right, the Navi might too. Honda’s Grom, which is available in the international markets and also the source of inspiration for the Navi, does enjoy its own cult following. Ardent bikers love it so much that they have modified the Grom into many types such as a dragster, a tourer, a scrambler and as an off-road bike too. 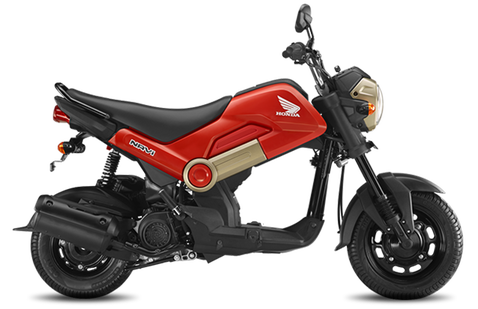 While the Grom bikes are compact 125cc motorcycles, the Navi is a blend of a scooter and a bike. With Navi you get the attractive design of a motorcycle and the convenience of a scooter with automatic transmission. This makes the bike so unique and special that with just one ride on this bike will make you want to buy it. The bike is so affordable that you wouldn’t mind buying it as your second bike, just to have fun riding it. As this is the only one in its segment, the Navi has the privilege of having no direct competitors. Honda Navi is a complete fun bike for all ages at an unbelievable price of just Rs.44,775 (ex-showroom Delhi). As the Honda Navi is inspired by the Grom bike, headlight setup looks a lot similar. With the matte silver finish, it looks very striking and bold. Front wheel mudguard and the telescopic suspension give the Navi a sporty bike look. Plastic panels that run across the bike give it a funky yet prominent appearance. The upswept round exhaust add a sporty appeal to the bike. Rear tyre mudguard with the monoshock lend the Navi a radical new-age look. Taillight is borrowed from the Honda Stunner, but blends well with this design. It has a neatly designed seat which is decent enough for 2 adults and the sporty tank with cover for the fuel cap, looks good. Switch and button quality is decent enough, but Navi misses out on the high beam flasher as well as the engine kill switch. Least interesting thing in this entire design concept is the speedometer console which is very basic and now comes with a fuel gauge. Best part of owning a Navi is that you can choose to customise it, to make it stand out from the crowd. There are a bunch of customisations available for this bike ranging from trendy graphics to complete makeover. Optional accessories like the luggage box, leg guards, handguards, headlight guard, windshield, rear luggage rack etc. are also available separately to customise the Navi as per your needs. Six colours available for this fun bike are Patriot Red, Shasta White, Black, Sparky Orange along with the newly introduced Ladakh Brown and Ranger Green. Honda Navi has the same 109.19cc, 4 stroke, SI engine that is installed on the Activa. The engine is very refined and runs on the Honda Eco Technology (HET) system, which is very fuel efficient. The bike churns out a max power of 8bhp at 7000 rpm and a peak torque 8.94 Nm at 5500 rpm, which is more than Activa, as the Navi is 7kgs lighter. Fuel tank capacity of the bike is 3.8 litres which is far less compared to Activa’s 5.3 litres. Riding the Navi in the city is a feast as it gets the same V - Matic automatic transmission. Max speed of the bike is 81 kmph and if ridden properly will get you a mileage of 60 kmpl. Some people may think, as the engine of the Navi is borrowed from the Activa, both must be similar in riding and handling. But the similarities end at the engine. With a wheelbase of 1286mm which is longer than the Activa, Navi on the whole is longer and wider as well. As a result the Navi is very nimble to ride in city traffic and handles very well. Ground clearance is more on the Navi compared to the Activa by 3mm, which helps you get over those bumps easily. 12-inch front and 10-inch rear tubeless tyres from CEAT provide decent road grip. With telescopic front suspension that's missing on the Activa, and spring loaded hydraulic type rear suspension, riding over rough roads is pretty easy. The seating posture is nice and comfortable with raised handlebars and properly set footpegs. Braking is decent enough with the 130mm drum brakes at both ends. Price point at which the Honda Navi is being offered, you can only expect basic safety. The headlight of the Navi is very powerful compared to Activa and comes with the mandatory AHO feature. To make your life easier, the bike comes with a maintenance free battery.